This typewritten letter from Alphonse Bianco seems to be a copy. 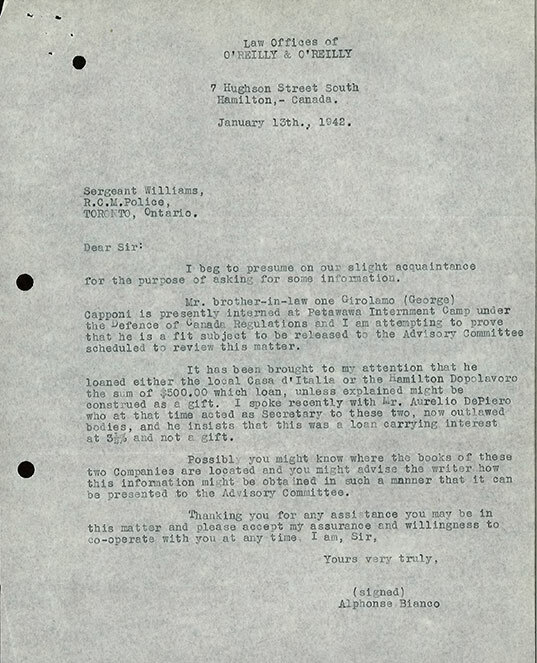 Addressed to Sergeant Williams, RCMP, Toronto, ON, it is dated January 13, 1942. Bianco is the brother-in-law of internee Girolamo Capponi and seems to be aquainted with the RCMP officer. He asks for information, as he is helping prepare Capponi's defence. He is trying to clarify the nature of monies Capponi provided to Hamilton's Casa d'Italia and Dopolavoro, which he believes were loans and not gifts. He claims that the secretary of the two organizations, Aurelio Del Piero (also interned but released in 1941), has confirmed they were loans, but that the financial books had been seized by the authorities.